The setting of the Prelude to our opera, The Margules Saga, is the California Audio Show, in August 2012. There, on first hearing Margules Audio's tube electronics, I wrote in my notebook, "great inner vitality, warm but with a welcome and appropriate bite." 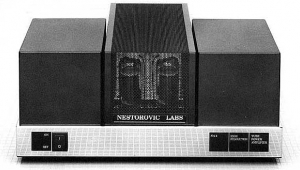 An encounter the following January inspired me to write, of a system that included an earlier version of the company's U280 amplifier, "The sound? Beautiful and warm. I've heard these electronics at two shows, and each time, I've left the room feeling good." Enter Julian Margules, owner and chief designer of Margules Audio, a Mexican company that is now almost 30 years old (see below). As we speak, memories of walking the empty lobby of Mexico City's grand Palacio de Bellas Artes, the ornate edifice in which Maria Callas gave some of her most stunning early performances, flooded my consciousness. What, I wondered, would Callas's astounding high E-flat, interpolated at the end of the Triumphal Scene of Verdi's Aida, sound like through Margules amplification? Subsequent exposure to various iterations of the U280 yielded more detailed assessments. From my coverage of the 2014 California Audio Show: "The sound was very beautiful, with wonderful air and spaciousness, and just a touch of distortion (perhaps from the LP or needle) . . . on fast passages of an LP of [Shlomo] Mintz playing the Mendelssohn Violin Concerto. . . . [T]his may not be the heavy metal system of someone's dark dreamsbut the lovely tube midrange sure made the music enjoyable . . ." At some shows the top seemed a bit rolled off; at others it seemed a little bright, and the bottom a bit shallow. Regardless, as I heard at the 2015 CAS, the sound was "supremely musical and capable of conveying joyful, delicate beauty with panache." 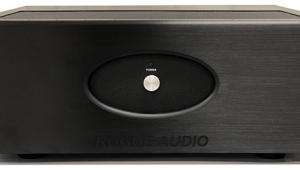 And at the 2016 Rocky Mountain Audio Fest, "liquidity was paramount, and the strings more real-sounding than in a lot of rooms. . . . 'Tube warmth without calling undue attention to itself,' I wrote in my notes." At all but one of these shows, the U280 was paired with Margules Orpheus loudspeakers. 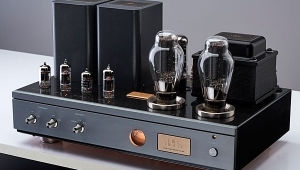 Hence my hesitation when Carlos Smith, Margules's US distributor, wrote me right after RMAF 2016 to propose that I review a pair of the newest version, the U280-SC Black stereo amp, used as monoblocks with the two channels strapped together. 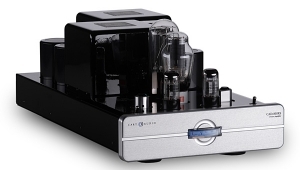 The U280-SC costs $6000 or $10,800 as a monoblock pair. My reference speakers, after all, are Wilson Audio Specialties Alexias. The Alexia may be one of the finest speakers of its size on the planet, but its impedance curve in the bass doesn't present the easiest load to a lower-powered tube amplifier. 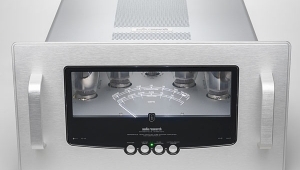 As John Atkinson responded to an online Comment on his review of the Alexia in the December 2013 issue, "the Alexia must be driven by an amplifier that isn't fazed by low impedances. . . the Alexia 'demands quite a lot of current from the partnering amplifier.'" Hence our opera's drama. 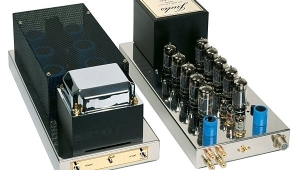 Would a pair of Margules ampsa single U280-SC Black, when strapped for mono, outputs 100W in Ultralinear mode and 55W in Triode modehave enough juice to drive the Alexias? If they didn't, what was I to do? I was reminded of a conversation I once had with Art Dudley. 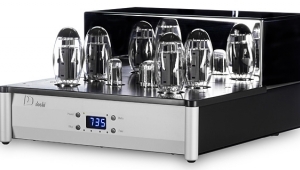 He explained that it is a Stereophile reviewer's responsibility to supply manufacturers with a complete description of his or her reference system. If the manufacturer thinks the equipment a good match yet that turns out not to be the case, the review nonetheless proceeds. It seemed to me that Julian Margules is a smart man, and that the Alexia's impedance curve is a known quantity. My heart kept saying, "Why don't you ask him if he thinks his amps can drive the Alexias?" My mind insisted that I leave the decision up to him. After all, my task is to convey my experience to the reader, not rescue manufacturers by suppressing information about mismatching. If all this sounds like the prelude to a tragic death scene, it isn't. For the sake of the drama, suffice it to say that if Callas had been presented with the score for our opera's next two acts, she might have declared the music too torturous and walked out. Then again, challenging roles like Tosca, in which the soprano suffers for the sake of art, were her strong suit. Which suggests at least the potential for success despite adversity. The Margules Group is the oldest continuously operating high-end company in Latin America. Julian Margules's grandfather, a German-educated Polish engineer who immigrated to Mexico, founded Emporio Eléctrico in Mexico City in 1927. In 1954, EE began morphing into Tel Rad, an electronic-supply company. (Tel Rad is now run by Julian's father, an octogenarian; Julian's son, Jacobo, represents the fourth generation of Marguleses to be involved in the company.) 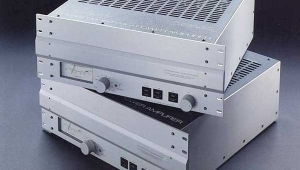 In 1985, Julian founded the high-end company Margules Audio, and released the first U280 amplifier; the company entered the US market in 2002. Among Margules's many current products is the 12th generation of the U280, the U280-SC Black. "SC" indicates the inclusion of the latest iteration of the company's proprietary Active Servo Control bias technology (more on this below); "Black" signifies both the new black shield on which the Margules logo is engraved and, in Margules's words, "the absence of color." I assume that this statement is both literalexcept for its wooden side panels, the U280-SC is indeed blackand figurative: a reference to an absence of audible coloration. 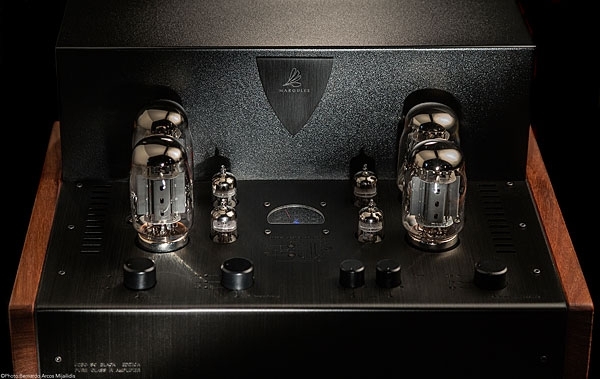 According to the Margules website, Active Servo Bias "actively tracks the input and output signal, allowing a full class-A output at any level or mode, without overdriving the tubes and transformers." Implemented by semiconductors I am told were designed for demanding aerospace applications, SC "also sets the DC bias and AC drive levels, assuring optimum electrical and sonic performance." SC is a tube roller's dream: With the U280-SC unplugged, you can painlessly swap out its four stock KT88 tubes with quartets of 6550, KT99, KT100, or KT120 tubes. 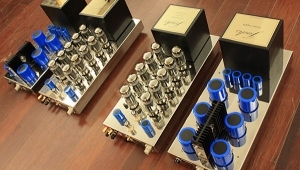 However, Margules counsels that the amp's four stock 12AU7 input tubes not be replaced with tubes of a different type, lest the circuit become unbalanced and distortion increase. The U280-SC Black's new differential output circuit is claimed to further reduce total harmonic and transient distortions. The manual claims that its input stages "include a special regulated SHUNT power supply" that "provides a dramatic improvement in Q damping, the key factor in regulating voltage for those stages. . . . Each channel uses separate regulators that further improve the U280-SC's already excellent imaging." The new power supply is "virtually indestructible due to specially designed regulation technology that protects the amp from major tube failures." Other improvements include: new, silver-coated epoxy printed-circuit boards and layout; military-grade potentiometers; precision metal-film resistors; and audio-grade inter-stage capacitors. Margules Audio doesn't use loop negative feedback, claiming that it results in loss of detail and richness. 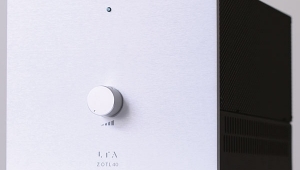 Instead, they use their Back Electromotive Force Sensor (BEFS), which changes the amplifier's output impedance per load requirement and, "along with the active servo allows the amplifier to drive difficult speaker loads with exceptional efficiency, dynamics and extended controlled bass." 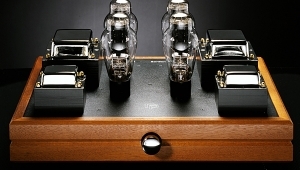 On the amp's top deck are two little switchesone for each pair of power tubes for toggling between Ultralinear and Triode modes; both must be set to the same mode, and can be switched on the fly. 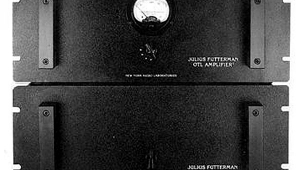 Between the two pairs of small 12AU7s is a blue-lit meter that shows the actual current passing through the right front output tube. Around 120mA is the maximum recommended current; anything above that and the amp is being overdriven, which can shorten tube life. In front of all that are five knobs. From left to right, these are: Mono/Stereo; Left Impedance (2, 4, 8 ohms); Left Gain; Right Gain; and Right Impedance (2, 4, 8 ohms). 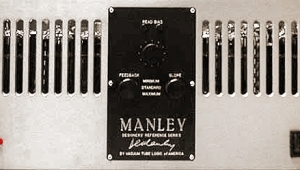 In mono mode, both channels must be set to the same impedance. When no preamplifier is used, the Gain knob is turned all the way down; otherwise, it's turned all the way up. Because I was using the dCS Rossini, which has its own volume control, I set the gain to the maximum. I'm not an engineer, so please excuse if this is a dumb question or I'm misusing terms. 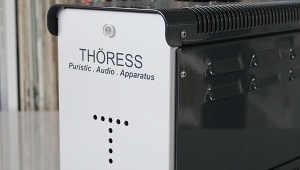 This amplifier's total harmonic distortion is stated as 0.08% at 7V RMS. Can the level of THD in an amplifier be converted to an effective bit depth resolution capabilty? ... S/N ratio of 62dB which is equivalent to a resolution of 10 bits. So if you play a 24/192 flac decoded by a 64 bit computer chip and converted by a DAC with 16+ bits of resolution and then sent to an amp with a 62dB S/N ratio (10 bit resolution), what gets sent to the speakers is 62dB (10 bit) resolution? ... a random uncorrelated signal, THD is the sum of signals which are harmonically related to the fundamental tone. If you look at Fig. 16, note that the second harmonic is at about -40dB, the third harmonic at about -55dB, and all higher harmonics are at or below about -70dB. Thank you very much for the explanation. It makes sense that the resolving capability of the system can't exceed its 'lowest-res' component. Another way of looking at the THD in component measurements that I hadn't realized before. 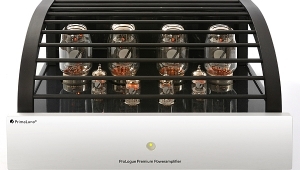 ... the Harbeth Monitor 40.2 speakers and a pair of the Audio Research Reference 250 SE amplifiers. This product is perfect for a comparo. You know those follow ups where another reviewer compares experiences? This would seem great to continue to try to wrap my head around this product. Even the manufacturer is fascinating. what did the Wilson people have to say? Wow, the Amp has beautiful engraving, I bet they'll start a trend of using a CNC machine to do this gorgeous chassis decoration. It's kinda like one of those artistic Tattoos we occasionally see. It's a Beautiful Amp, I'd like it to be a success. Some of this Company's other offerings are also beautiful. This will be audible with most speaker, so we have an example of another effect box here, rather than an amplifier. That's an interesting way to put it. I hadn't thought of the term 'effect box,' you said it well. An "effect box" ? Really? Terrible things those amplifiers or source components that make pleasing sounds. Oh wait we cant call them truly amplifiers because they may make music sound pleasing to the ear. That's not what music is supposed to do. Is the SET distorted sound still 'pleasing' when playing complex philharmonic orchestra, Beethoven, Mahler? Do we want a modified sound or true reproduction of the recorded sound? ... was asking the very same question 30 years ago. "Should an amplifier be pleasant sounding, or should it be accurate even if accuracy is not as pleasant?" Well, the question put this way is no good. 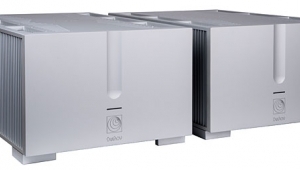 Well designed and engineered amplifier is never "unpleasant sounding", in case you have good speakers, good listening room, good recordings and good signal source. If someone listens to commercial music only, I agree it is a pain since pocket audio started with iPod in 2001 (thank you, Steve) and huge dynamic compression took place almost everywhere (sounds good in subway for millions, right?). But with good classical recordings, good speakers and listening room, good DAC, the accurate amp never sounds boring or unpleasant. Please find a real fault in other parts of the audio chain. Read the Hafler letter again. "Not as pleasant" is not the same as "unpleasant." Also read the op-ed piece from AD linked above.